Our favorite authentic Venetian Glass in classic Zanfirico, Millefiori and exterior 24kt gold foil in rubino pink Murano glass. This zanfirico is produced for us by our friends in the furnace in Murano and provided to our beadmaker. We use 24kt gold foil on the exterior and it is subject to wear with use and exposure to oils and chemicals. 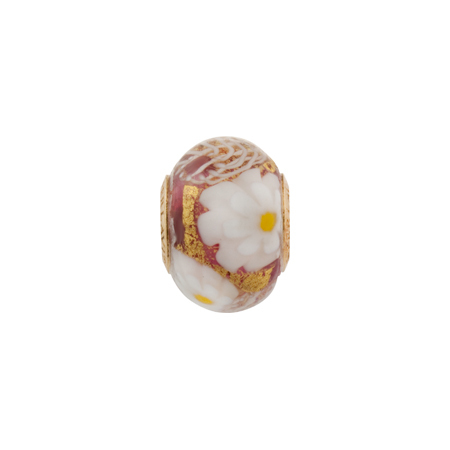 The bead is approximately 15mm in diameter with a Vermeil, Gold plated .925 Sterling Silver Insert.